One often overlooked Disney Parade is the one that occurs each afternoon in Disney's Animal Kingdom. It is called Mickey's Jammin' Jungle Parade and it may be the best day time parade that runs at Disney World. Mickey's Jammin' Jungle Parade is a lively processional of creative animal shaped vehicles and gigantantic puppets all moving to the beat of the music. The parade starts in Harambe Villlage in Aftrica, makes its way towards the Tree of Life, continues around the Tree of Life towards Asia, and completes the loop by continuing on and returning to Harambe. The animal based creations are really unique and fun to see. The cast members use their "animals" to engage the crowd and often stop to interact with guests, making the experience mroe memorable for many young Disney fans. The main premise of the parade is that Mickey Mouse, Minnie Mouse, Donald Duck, and Goofy are taking off for a Jungle Expedition. In the picture above you can see Minnie Mouse in her safari vehicle all loaded up with items for her adventure including her bathtub. The floats and puppets have a rustic look to them that makes them very appealing. It is much more befitting the overall Animal Kingdom experience versus a more polished look. Pictures describe the parade much better than words, so we have included many pictures so that you can get a sense of the marvelous animal creations that await you during Mickey's Jammin' Jungle Parade. Unfortunately what you don't get a sense of is the music that accompanies the parade. It makes the atmosphere fun. You can see that many of the floats have encorporated a drum or percussion instrument built right into the design to further enhance the music. Moreso than any other current Disney World parade, Mickey's Jammin' Jungle Parade reminds us of the Tapestry of Dreams Parade that used to exist in Epcot. I believe it is the similarity between the two in terms of design that makes this one so special. Stay Longer At Animal Kingdom To See This Parade! Although many people find themselves leaving Disney's Animal Kingdom early in the afternoon and therefore are gone before the typical 4:00 pm parade time, I hope this post will inspire you to stick around to make sure that you get a chance to see this wonderful parade. You will be glad that you did! 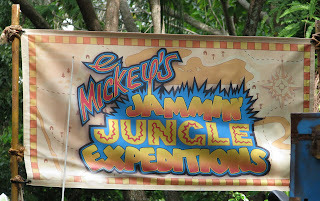 3 comments to "Mickey's Jammin' Jungle Parade at Disney's Animal Kingdom"
Fabulous Terrah - Thanks for the comment. Glad you are enjoying Only WDWorld!